Pet ownership can bring plenty of unexpected benefits for seniors. For starters, research shows that older adults who own a dog walk an average of 22 minutes a day more than seniors who don’t have a dog, and pets are even used in therapy techniques to help seniors with mental illness or dementia. While the benefits to pet ownership for older adults are numerous, there are also unique challenges when bringing your pet to an assisted living community, including some communities’ lack of space and restrictive pet policies. We’ve put together a guide that carefully examines the benefits and risks of owning a pet in assisted living, as well as what to consider before adopting a pet into an assisted living community. For pet owners who are planning on moving into an assisted living community in the future, this guide includes advice for choosing a pet-friendly assisted living community and a directory that allows you to research pet-friendly assisted living options in your area. The benefits of owning a pet for older adults are undeniable. However, when bringing a pet into an assisted living facility, there are also some risks that should be carefully considered. There are three main ways pets can have a positive impact on the lives of older adults. First, owning a pet helps seniors be more active. A 2017 study concluded that older adults living in a community setting (such as assisted living) who own a dog walked an additional 22 minutes per day more than their counterparts. Another positive impact is an increased sense of purpose. Seniors report that knowing their pets depend on them gives them a reason to get up in the morning. Finally, pets provide companionship, which helps seniors feel less alone – especially those who’ve lost a spouse or other close friends or relatives. Research shows that these factors can lead to positive, tangible benefits for seniors, including the following. A Lower Risk of Heart Attacks: A 2017 Swedish study confirms prior studies which suggest that people with pets have a lower risk of heart attacks. Increased activity from owning pets is likely a large factor lowering the risk of heart disease. More Social Interaction of Seniors with Dementia: Research has shown that pets and animal therapy can increase socialization capabilities. While owning a pet doesn’t slow the rate of cognitive decline, it can help manage symptoms. Lower Depression, Anxiety and Loneliness: Animal companionship has been shown to have a positive impact on older adults who struggle with depression and anxiety. The companionship, sense of purpose and increased activity that pets provide or encourage are all influencing factors. Calmness and Less Stress: Physically touching a pet (such as petting a dog or cat) often brings a sense of calm and may help to alleviate stress. While there are many benefits to owning pets, bringing or adopting a pet into an assisted living community also presents some risks that should be considered. Cost: Pets are expensive – especially as they get older. In addition to the ongoing cost of feeding and grooming the animal, the cost of veterinary care and any needed medications should be considered. Seniors who bring a pet into an assisted living facility can run the risk of having to eventually choose between the pet or other necessary expenses. Inability to Provide Adequate Care: Seniors who move into an assisted living facility often do so because of declining health or mobility. There’s a substantial risk that a resident may not be able to adequately care for their pet as they continue to age. Feeding, grooming, walking and cleaning up after the animal may become increasingly difficult with age. Liability: Dogs that are used to living in a single-family home may have unexpected reactions to being in such close proximity to other animals and people. Seniors face the risk of liability if their pet damages another person’s property, another animal or hurts another resident. While not all animals will react poorly, it is a risk that should be taken into account. Conflict Between Residents: Not all seniors enjoy animals, and owning a pet could be a source of conflict in some situations, such as if the dog barks and annoys another resident and that resident complains to management. When searching for an assisted living community, finding out about its pet policy can be an afterthought. However, many seniors may view getting rid of a pet as a deal breaker, and rightly so – pets not only offer companionship but can also become like family members. That’s why it’s critical for seniors who are attached to their animal companions to seek out assisted living communities that allow them to bring their pet(s). Not all assisted living communities allow residents to own pets, and those that do often have restrictions in place. The good news is that seniors who have one or two small dogs or cats can typically find an assisted living community that will allow them to enjoy the benefits provided by animal companionship. Extra Deposit: Seniors who bring pets may have to pay an additional, refundable deposit. Limited Number: Communities often limit the number of pets that residents may bring or adopt. A common limit is 1-2 pets. Non-Exotic Pets: Exotic pets are typically considered animals that aren’t usually domesticated. An example would be a wolf or a python. Breed & Temperament: Many communities disallow dog breeds such as pit bulls. This can take the form of specific prohibitions or more general guidelines such as “no ‘attack-type’ breeds.” An animal also needs to have a temperament that allows staff to enter the residence. Age & Training Requirement: Dogs are often required to be at least one year of age and be housebroken. Noise & Behavior Complaints: Many communities have rules regarding noise complaints or destructive behavior. If a certain number of complaints are received and the behavior doesn’t improve, the pet may have to leave. Vaccinations: It’s often required for residents to provide proof of vaccinations before bringing a pet to live in the facility. Designated Pet Caretaker: Some communities require residents to designate a person living in the area who is willing to take care of the animal in case a resident isn’t able to, such as if he or she is recovering from a surgery or experiences a sudden decline in health. Seniors who currently own pets and are (or will be soon) making the transition to live in an assisted living facility should carefully consider the decision to bring their animal companions. While the very idea of giving up a beloved pet to another family may be heartbreaking, it’s important to realistically examine the senior’s capabilities, as well as the pet’s well-being. Is the pet used to a large yard or freely moving around? Active dogs who are used to a large yard may not do well when moving to a small apartment in an assisted living community. Also, cats that are accustomed to coming and going out of the home whenever they wish may not be happy being confined to a small space. How difficult will it be to find a community that allows your pet? If you have a larger dog or dog breed that’s viewed negatively by some (whether fairly or not), it may be very difficult to find an assisted living facility that will accept your pet, and you may have to make sacrifices in other areas, such as location, price and amenities. Will you be able to adequately care for the pet? Seniors often move to assisted living communities because their health and mobility are declining to the point where they need help with everyday activities. Seniors should consider whether they will be able to adequately exercise and care for their pet, both now and in the near future. Can you afford to continue to own a pet? Assisted living isn’t cheap, and the costs of pet ownership can add up – especially as the animal ages. Between vet bills and the simple cost of food, seniors on a fixed budget may not be able to afford a pet on top of the increased cost of living. While there are important questions to consider when bringing a pet to an assisted living community, there are also many benefits of pet ownership for seniors, which will be explored in more depth below. In addition to allowing pets, some assisted living communities go the extra mile to provide extra services and benefits for pet owners, or provide pet therapy for residents who don’t have pets. Keep in mind that these communities may be more expensive, or there may be an additional fee to access the services of a pet coordinator. Pet coordinators ensure pets’ day-to-day well being. Many seniors view their pets as part of their family, and there are some assisted living communities that share the same perspective. As such, these communities ensure that both the owner and the pet receive the care that they need. A pet coordinator can help to exercise pets, clean up after them, keep them up-to-date with vaccinations, facilitate veterinary appointments and help with administering any medicine that may be needed. Pet coordinators take care of all the details so that seniors who wouldn’t normally be able to care for a pet can enjoy the benefits of pet companionship. Pet therapy programs provide access to animal companionship without the responsibilities. 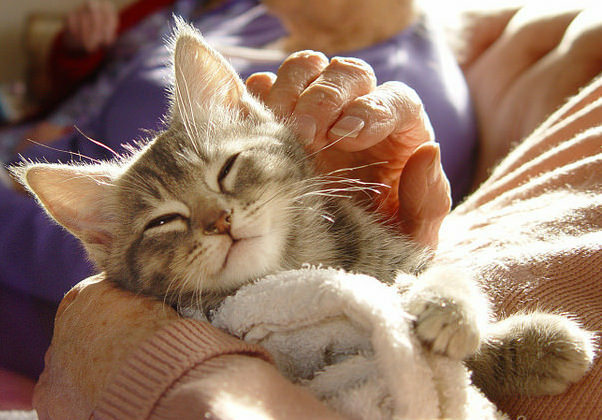 Many assisted living communities are coming to better understand the value and benefit that pets can provide to seniors. A pet therapy program or “a community pet” is a way for seniors to access animal companionship, without having to worry about the expense and effort of feeding, exercising and grooming. This service ranges from providing dogs that are trained to provide therapy to simply having a community pet that residents can spend time with at their convenience. While finding a community that accepts pets is often a top priority for pet-owning seniors, there are numerous other factors to consider as well. The directory below allows you to quickly find and research thousands of communities that are pet-friendly. For the specific details about the company’s pet policy (such as breed and weight restrictions), use the information provided to contact the community directly. If you currently live in an assisted living community and you’re considering the idea of owning a pet, there are a number of questions to consider before you make this important decision. Keep in mind that some facilities may not allow you to adopt a pet at all after you move in, while others have specific restrictions in place, such as requiring the animal to be potty trained and more than a year old. Can you afford to adopt a pet? One of the primary concerns when considering adopting a pet is the potential cost. The American Society for the Prevention of Cruelty to Animals (ASPCA) estimates that the annual cost of owning a small dog is $512, or $737 with health insurance. Those who don’t opt for health insurance for their pet risk the chance of large, unexpected vet bills. Cats tend to be more expensive than small dogs with a yearly expense of $634 without health insurance and $809 with health insurance. On top of the normal annual expense of owning a dog, the first year of owning an animal comes with increased costs. For a small dog, the initial extra cost averages about $470 and $365 for a cat. This means that the total first-year cost for a small dog can be $1,207 (not including the cost of grooming for long-haired breeds if needed) and $1,174 for cats. Will you have proper accommodations for the pet in question? Different breeds and sizes of animals have different space needs. For instance, residents considering adopting a medium or large dog need to consider the animal’s need for exercise. Being cooped up in a small apartment all day might be fine for a very small dog, but a bigger dog may not respond well. The dog’s breed also plays a part – some breeds have much more energy, and consequently, benefit from more space. Another consideration is what the animal is used to – if you are planning on adopting an older dog or cat, the pet may be used to more space or freely moving around the yard or neighborhood. Finally, you should also consider the pet’s age. For example, a dog just past its puppy years will most likely have much more energy than a dog well into its adult years. For that reason, adopting a younger dog or a puppy into a small apartment may not always be wise. Will your health allow you to properly care for the pet? While owning a pet provides numerous physical and health-related benefits, the daily responsibilities of owning a pet may become a burden for those with declining health or decreasing mobility. While animals such as cats may not need as much care as dogs, many pets require regular exercise or to be let outside to relieve themselves. When considering adopting a pet, seniors should consider the future since this is a long-term decision – they may be able to adequately care for the pet right now, but declining health and mobility can make this a challenge in the future. What happens when you can no longer care for your pet? As mentioned above, declining health and mobility may make it difficult to care for the pet in the future. Those who don’t foresee a significant decline in health or mobility in the near future may still choose to adopt a pet, but they should make a plan for their pet should an accident or health problem suddenly arise. Whether required by the community or not, it’s wise to arrange for a loved one or friend to care for the pet if you are unable to. Making this plan ahead of time can relieve stress and potential problems in the future. Are the pet’s breed and temperament suited to an assisted living community? Pets living in an assisted living facility need to be good with strangers and all types of people, since it’s normal to have staff enter your room or apartment on a regular basis to provide assistance with daily activities such as cleaning. While this isn’t typically too big of a concern for a cat, residents who are considering adopting a dog need to be sure the pet is great with people. Also, keep in mind that dogs adopted from a shelter may have had bad experiences in the past with certain types of people. Large men, for example, may cause the dog to react aggressively due to past trauma even though the dog is normally very calm and docile.